We purchase only the highest quality organic, locally grown catnip for our cat toys, and we dye our fabrics "in house" using non-toxic, reactive dyes and natural products like soda, salt and cold water rinsing to reduce our environmental impact. 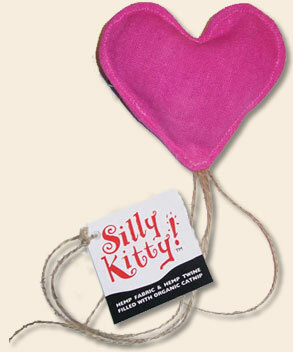 The Silly Kitty™ Heart is a pink, Hemp heart filled with high potency organic cat nip locally farmed in Canada. Bio-degradable and earth friendly, the Silly Kitty™ Heart is a big hit with cats of any age. Give your kitty your heart and let them have hours and hours of fun! Originally developed as a small cottage industry on Salt Spring Island, British Columbia Canada, Silly Kitty Pet Products™ has been producing Hemp pet products for the past eight years. Over time the company has grown steadily and now provides quality Hemp products to stores throughout North America. The early philosophy of the company still remains, to provide eco-conscious consumers with an alternative to foreign made pet products. We are a company that supports the idea of responsible consumption. We employ a Canadian labour force to manufacture our products and purchase locally farmed, high potency cat nip for all of our cat toys. We do not over package our products or use plastic of any kind in our packaging. Our products are dyed "in house" using low impact dyes, soda, salt and cold water rinses to reduce our environmental impact. Also, the Silly Kitty™ cat toy is fully bio-degradable - our way of reducing the heavy burden on landfills...did we mention that cats go crazy for the Silly Kitty™? We could not have enjoyed sustained responsible growth without this fact. Our products are made for your pets and your pets LOVE our Hemp products!